This clinical report describes the step-by-step protocol for novel, 100% non-prep, custom-modified, prefabricated composite veneer restorations in the case of an esthetic rehabilitation of a patient presenting peg-shaped lateral incisors and undersized maxillary central incisors. A correct diagnosis, comprehensive treatment plan, and an interdisciplinary approach are necessary to obtain optimal conservative and predictable esthetic results. When treating the color of a single tooth in the esthetic zone, it is a complex task to achieve the same visual effect as the rest of the teeth. In addition to the problem of the clinical crown color, if the patient has a thin periodontal biotype it is necessary to manipulate both the hard and soft tissue to achieve a good esthetic result. To change the biotype, a connective tissue graft needs to be performed. The graft must be stabilized exactly where it is needed, and the recipient area modified. The tooth needs to receive an adequate preparation so as to make the restoration thick enough to naturally mask the treated tooth, while also ensuring long-term stability. Objective: To assess the esthetic effectiveness of four illusion techniques applied to a composite resin veneer for diastema closure between maxillary central incisors. Materials and methods: An acrylic model with six natural maxillary anterior teeth was fabricated with a 2-mm diastema between the central incisors. Resin veneers were constructed on the left central incisor and the following cases were derived: V0: no veneer; V1: veneer without optical illusion features; V2: veneer with centralized interproximal ridges; V3: veneer with curved incisal edges; V4: veneer with gray pigment mesially/distally; V5: veneer with gray pigment on the developmental lobes. Digital printed photos of the models (13.2 x 17.8 cm, and 6.1 x 8 cm), with low, medium, and high smile lines and without a smile line (processed by Adobe Photoshop CS6) were shown to three groups of people (faculty members, senior undergraduate students, and patients; n = 25/group) for them to assess the overall size and width of the two central incisors. The results were analyzed by Pearson's and chi-square goodness of fit tests. Results: There was no significant influence in the estimation of the two central incisors as being the same size, according to the technique used (P = 0.869) and group of evaluators (P = 0.209). The estimated probability of assessing the tested incisor as wider was indicatively lower in V2 compared to V1 (adjusted odds ratio = 0.59; P = 0.088). The height of the smile line affected the evaluation of the veneers only in the large-sized photos. Conclusions: No interference is the best esthetic decision concerning a 2-mm diastema closure when restoring only one central incisor with a laminate veneer. The next best option is to deliver a veneer with centralized interproximal ridges. 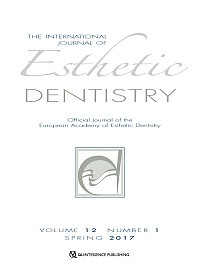 Aim: The purpose of this study was to investigate the sealing ability of three different resin cements for the luting of a porcelain laminate veneer (PLV) to the enamel and dentin of fluorosed teeth. Materials and method: Thirty incisors with moderate fluorosis according to the Thylstrup-Fejerskov Index (TFI = 4 to 6) received a veneer preparation with dentin margins at the gingival third. The IPS Empress (Ivoclar Vivadent) veneers were luted to the teeth of three groups (n = 10) using three different resin cements: Group 1: Excite DSC/Variolink II - etch-and-rinse (E&R), Group 2: ED Primer II/Clearfil Esthetic - self-etch (SE), Group 3: RelyX Unicem - self-adhesive (SA). After 24 h of water storage and thermocycling, marginal microleakage was evaluated on three slices from each tooth using the dye penetration technique under a digital microscope. Results: Data (microleakage percentage over the entire preparation length) were analyzed using the Kruskal-Wallis and Mann-Whitney tests (P < 0.05). Mean microleakage percentage was 0.8% to 18% at the enamel and dentin margins, respectively. On the enamel, Group 1 (E&R) exhibited significantly less microleakage compared to Groups 2 (SE; P = 0.03), and 3 (SA; P = 0.005). On the dentin, microleakage in Group 3 (SA) was significantly less than that in Groups 1 (E&R, P = 0.001), and 2 (SE; P = 0.03). The difference between the latter two groups was significant, with Group 1 (E&R) exhibiting the greatest microleakage. Conclusion: The best enamel and dentin sealing of the cemented veneers was obtained with the E&R and SA luting agents, respectively. Objectives: This study evaluated the adhesion of self-adhesive resin cement to zirconia after various surface conditioning methods in non-aged and aged conditions. Methods: Zirconia (IPS e.max ZirCAD, Ivoclar Vivadent) and resin composite blocks were obtained and randomly divided into four groups according to one of the following surface conditioning methods: C: No surface treatment (Control); AS: Air abrasion (50 µm Al2O3) at low pressure (0.2 MPa) plus silane (Monobond Plus, Ivoclar Vivadent); MC: Methylene chloride for 60 min; CE: Chemical etching solution at 100°C for 60 min. Surface roughness (Ra) measurements were performed on the control and conditioned zirconia specimens using a profilometer. Each conditioned zirconia block was bonded to its corresponding resin composite block using self-adhesive resin cement (RelyX Unicem Aplicap, 3M ESPE) under a load of 300 g. Half of the groups were tested without aging; the other half were tested after x6000 thermocycling. Sticks were obtained from bonded specimens and subjected to microtensile bond strength (MTBS) testing in a universal testing machine (0.5 mm/min). Failure types were classified after debonding. Data (MPa) were analyzed using two-way ANOVA and Tukey's tests (? = 0.05). Results: The highest mean Ra value was obtained in Group CE (0.52 µm), and the lowest in Group C (0.25 µm). Significantly lower MTBS test results were obtained in Group C, both in non-aged (17.4 ± 1.1 MPa) and aged (5.11 ± 0.5 MPa) conditions than in the other groups (34.6 ± 1.5 to 51.2 ± 1.1 MPa; 28.0 ± 0.9 to 49.5 ± 1.0 MPa in non-aged and aged conditions, respectively) (P < 0.05). Group CE presented the highest MTBS test results in both non-aged and aged conditions (51.2 ± 1.1 MPa and 49.5 ± 1 MPa, respectively) (P < 0.05). Failure types were predominantly adhesive in all groups before and after aging. After aging, less adhesive and more mixed and cohesive failures in cement were observed in Groups AS and CE than in the other groups. Conclusion: Chemical etching of zirconia may have potential use as a substitute for air abrasion as a surface conditioning method for zirconia. Boruziniat, Alireza / Manafi, Safa / Cehreli, Zafer C.
Aim: To evaluate the effect of a new experimental solution containing sodium ascorbate (SA) and acetone on reversing compromised bonding to enamel immediately after bleaching. Materials and methods: The buccal surface of intact, extracted human premolars (n = 60) was bleached. The teeth were then randomly assigned to 6 groups according to the type of pretreatment applied prior to adhesive procedures: 10% SA in acetone-water solution applied for 1 and 5 min (groups 1 and 2, respectively); aqueous solution of 10% SA applied for 10 min (group 3); 100% acetone applied for 10 min (group 4); no pretreatment (negative control; group 5). An additional group (positive control; group 6) comprised unbleached teeth (n = 12). Two composite microcylinders were bonded on each specimen for evaluation of microshear bond strength (MBS) and failure modes. Data were analyzed using the one-way ANOVA and Tukey's post-hoc and chi-square tests at P = 0.05. Results: Groups 1 and 2 yielded similar MBS values to groups 4 and 6 (positive control). The mean MBS of groups 3 and 5 (negative control) were similar, and significantly lower than that of the positive control group. Conclusion: The application of 10% SA in an acetone-water solution prior to bonding procedures can restore compromised enamel bond strength to its unbleached state within a clinically acceptable time of 1 min. The objective of this study was to evaluate the effects of different bleaching techniques on the tooth-restoration interface of composite restorations. Cavities (3 x 3 x 2 mm) were prepared in 100 bovine incisor fragments, which were etched with a conventional adhesive system and restored with a nanocomposite. The fragments were randomly divided into five groups (n = 20): Control (no bleaching), At-home bleaching (HB) (10% hydrogen peroxide [HP]), In-office bleaching (OB) (35% HP), LED-activated bleaching (LB) (35% HP activated by LED), and Laser-activated bleaching (LaB) (35% HP activated by diode laser, ? = 880 nm). After bleaching, 10 samples per group were thermocycled (500 cycles, 5°C to 55°C), immersed in 50% silver nitrate solution, sectioned, evaluated under a stereomicroscope, and scored for microleakage. The other samples were pH cycled for 14 consecutive days, sectioned, and the enamel adjacent to the adhesive interface assessed by cross-sectional Knoop hardness. The data were compared using the one-way ANOVA (? = 0.05). No differences between the microleakage indexes found for the control and experimental groups were observed. The enamel of the bleached groups located near the adhesive interface presented the same Knoop hardness numbers as the samples of the control group. Tooth bleaching does not damage the tooth-restoration interface of composite restorations. The focus for the achievement of complete success in the esthetic zone has traditionally been on addressing deficiencies of intraoral hard and soft tissue. Often, these deficiencies are accompanied by esthetic concerns regarding the lips that are routinely neglected by the dental team. A predictable plastic surgery technique - the lip lift - has been used for decades to enhance lip esthetics by shortening the senile upper lip to achieve a more youthful appearance. Over the years, this technique has been refined and used in many different ways, allowing its routine incorporation into full facial esthetic planning. Through restoration of the upper lip to its optimal position, the artistry of the dentist and dental technician can truly be appreciated in the rejuvenated smile. By the introduction of this minimally invasive surgical technique to the dental community, patients stand to benefit from a comprehensive orofacial approach to anterior dental esthetic planning.